When I was growing up, making a promise was a big deal. My parents made sure we knew from a young age that making a promise was serious. It was not something to be taken lightly. If I made a promise, I needed to make every effort to follow through and keep that promise. As much as I’ve tried to live by that principle, I’m sure that somewhere along the way, I’ve broken a promise. In reality, a promise is only as good as the ability of the person who made it to follow through on it. 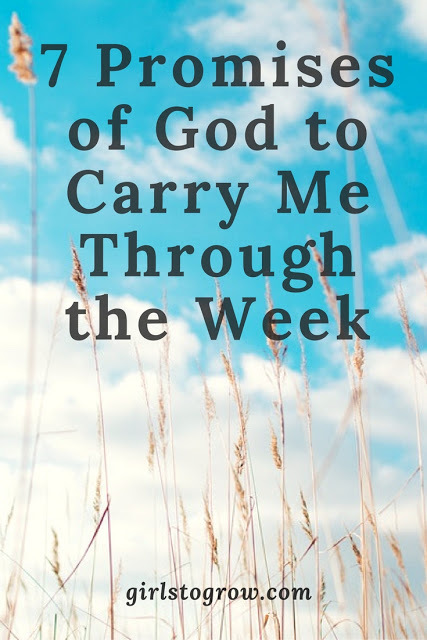 After I wrote recently about praising God because He keeps His promises, I challenged myself to meditate on some of those promises. In case you’d like to do the same, I’ve broken seven of them down by days of the week. You could use this same format, rearranging the order of the promises, or exchanging your own favorite promises for the ones I’ve listed. Sunday: Salvation. Many verses in the Bible communicate God’s promise of salvation, but one of the most direct is Romans 10:13. “For whosoever shall call upon the name of the Lord shall be saved.” How wonderful that the plan of salvation is simple enough that even our children can understand and accept Jesus Christ as their Savior at a young age. I especially like reflecting on this promise on Sunday. It reminds me of His resurrection, which brought victory over sin and death. Monday: Peace. It may feel like every thing’s coming at me on a Monday! Philippians 4:6-7 tells us to be careful or anxious for nothing, but to take everything to God in prayer. He promises that His peace, which can’t be explained, will keep our hearts and minds. Everything – any concerns about our children, marriage, financial pressures, job uncertainties, health issues – can be laid at His feet. If we will allow it, His peace will flood our soul. Tuesday: Wisdom. Every day of the week brings a need for wisdom! James 1:5 assures me that when I lack wisdom, if I ask God for it, He will give it generously. This is also a reminder of the importance of Bible reading, study, and meditation to my daily walk. That’s where I can find guidance and answers to many of my issues. Wednesday: Power. By Wednesday, I may feel overwhelmed with how my week’s going. I need access to the power of God, and Philippians 4:13 states, “I can do all things through Christ which strengtheneth me.” Not on my own will things get accomplished, but through the Holy Spirit’s leading, I can do anything that God calls me to do. Thursday: His presence. According to Hebrews 13:5, God has said, “I will never leave thee nor forsake thee.” What a comfort to know that there is nowhere I can go and no circumstances I can face that will cause Him to leave me. Friday: Direction. I can rest in Proverbs 3:5-6, which tells me that if I trust the Lord with all my heart, don’t lean on my own understanding, and acknowledge God in all my ways, He will direct my paths. I also get excited to read Psalm 84:11, which says, “….no good thing will He withhold from them that walk uprightly.” If I’m walking with Him, He will bring into my life those things that are good for me. Saturday: Provision. I’ve made it through another week! I can look back and see what God has done and praise Him for it. “But my God shall supply all your need according to His riches in glory by Christ Jesus” from Philippians 4:19 lets me know that not only does God know the needs in my life, but He has the resources available to meet each and every one. I want to make a habit of recognizing God’s promises as they’re fulfilled in my life. 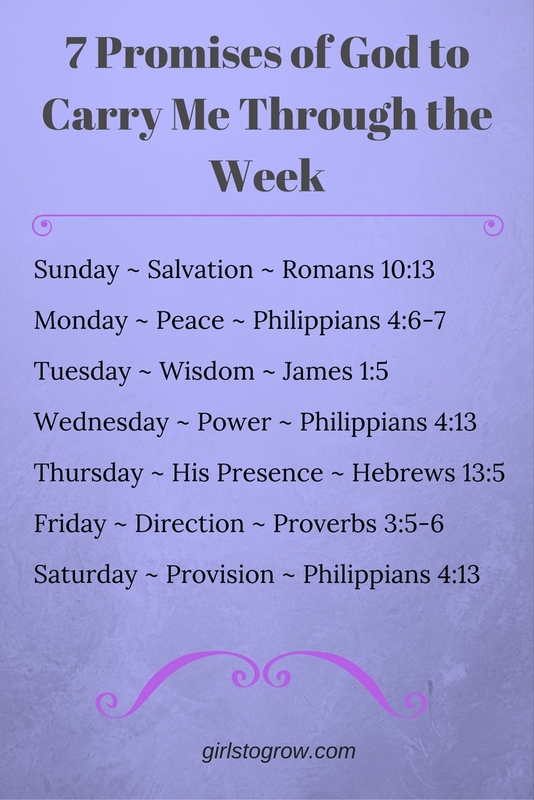 If you journal, you could designate a page for writing down the promises of God you see fulfilled in your life each week. What’s another promise of God that’s meaningful to you? What Kind of Grace Do You Need Today? It truly is powerful to meditate on the promises of God, broken down like this!